The Main Live window is the largest window, which shows the live streams. 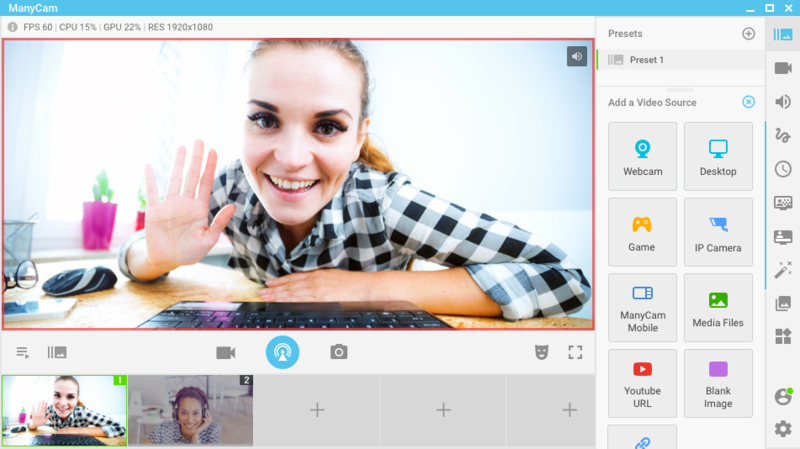 You can use up to twelve video presets allowing you to modify your video the way you want. The Main Live window shows the output picture with all of the effects currently chosen and settings applied. The output image you see in the Main Live window is being transmitted to the application where ManyCam Virtual Webcam is selected as a video source. ManyCam Live window displays the content of an active video preset. You can tell which preset is active by the color of the preset number in the upper right corner – green means it’s active, grey – inactive. You can make a snapshot or a video clip by clicking on a “Record” or “Snapshot” buttons located under the Main Live window. Your snapshots and videos are saved in the Gallery Tab. There you have 2 albums “My snapshots” and “My recordings” respectively. 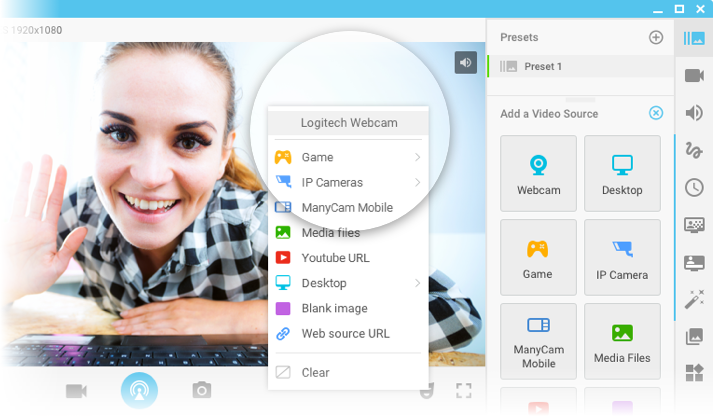 By clicking on the Main Live window or on a preset window you can choose the output image: your web camera, game, IP cameras, your desktop areas, media files, YouTube videos, camera of your mobile or some blank images. Learn how to connect ManyCam with other apps or websites.